We live in a moment when many photographers and audiences have become ambivalent and self-conscious about documentary photography as a means to make statements about the condition of the world. Edmund Clark, however, effectively uses a documentary mode in a political context. His approach brings to mind Walker Evans’ distinction between “useful” documentary and art in a “documentary style”, a distinction that only highlights the difficulty of defining “documentary”, and which has since been blurred by photographers in myriad ways. Evans was the master of an apparently artless and distanced objectivity that masked an incisive, critical way of seeing. Edmund Clark’s Control Order House, a commentary on the state’s exercise of control, is a particularly welcome and thoughtful intervention that operates in precisely this vein. Control Order House visualizes the everyday life of an individual who is subject to the state’s extreme authority. In doing so, the book draws attention to ongoing changes in the relationship between state and citizens. As with Guantanamo: If the Light Goes Out, his compelling 2010 exploration of the extraterritorial detention camp, Clark is interested in post-9/11 legal systems that parallel yet differ from those enjoyed by most of the rest of US and UK society. Clark’s latest book juxtaposes a systematic visual documentation of a Control Order House against a collection of documents pertaining to a controlled person, “CE”. Although CE himself is absent from the photographs, Control Order House describes his dreary and isolated life, alternatingly absurd and disquieting, familiar and disconcerting. Pictures and texts together enlarge the reader’s sense of how political and legal decisions are lived in the world. Between 2005 and 2011, the United Kingdom’s “Prevention of Terrorism Act 2005” gave the Home Office the authority to detain individuals suspected of terrorism under a Control Order, a form of detention operating outside of the conventional criminal justice system. 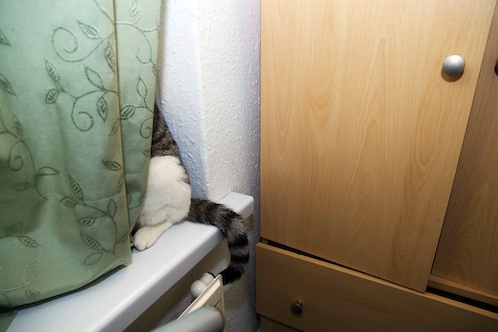 Controlled persons were heavily restricted in their movements and communications, and relocated to unmarked, apparently ordinary houses within the UK. 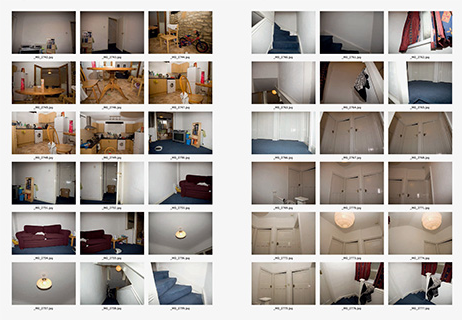 In 2011 Clark made a request to the Home Office to photograph within a Control Order House; the request was granted under certain conditions, including not revealing the identity of the controlled person. Clark photographed the domestic trappings of the house in an unknown location in the UK over three days and two nights. The most compelling sections of the book are those that reveal the specificity of CE’s experience. Clark presents all of the images that he made, in order, eighteen pictures to a page. Some five hundred pictures are here, beginning with the textures of the surfaces and moving through every room and space of this under-furnished house. The pictures are flash-lit and flat, displaying the wear of the house, with its dated cabinet knobs, stained carpet, curtains, utterly blank white walls. Also shown are the mundane objects of CE’s life: hairdryer, flip-flops, books, and his cat, who appears throughout. Included as well is a brief journal that Clark asked CE to write describing his everyday activities, which, as one might expect, are repetitive under these conditions. The book itself takes the form of a dossier, sort of a cross between a legal docket and an architectural survey, and includes the guidelines for the controlled person. One document reads like a lease agreement (“You must not do anything to [sic] that may break the conditions of any insurance policy covering the property or cause the premiums to increase”). Another lists the many restrictions on the controlled person, such as limits on internet and telephone use, and on meeting with other people. An extensive legal document details CE’s case. We learn that CE is a naturalized UK citizen and that the Home Office’s proceedings against him center around suspicions that he trained in a terrorist camp in Somalia. This document, which provides a startling counterpoint to the banality of the pictures, also makes visible the High Court’s attempts to correctly interpret the detainee’s rights and obligations under the Control Order, and to not infringe upon them. Just as the photographs describe the tedium of a lifestyle shaped by exceptional circumstances, so do the hearings describe the effort to make ordinary the extraordinary. Clark’s pictures echo Evans’ work in their apparent disengagement, and Control Order House feels like a particularly successful marriage of documentary intention and documentary style. The images ostensibly show things “as they are,” and the text frames the subject in a specific social and political context. This tension between different kinds of knowledge brings Evans’ and James Agee’s Let Us Now Praise Famous Men to mind (not to mention Agee’s diligent cataloguing of his subjects’ personal effects and schedule). The form of Control Order House shapes the reader’s experience before the pictures are even seen, and when we look carefully at the pictures- twenty photographs are presented as half-page enlargements - the materiality of the place, the minutiae that make up CE’s life, are confirmed and made evident. Like Agee and Evans, Clark seeks to make a connection between the smallest details of a life lived under constraints with the broader, seemingly foreign system that has shaped those constraints. As Clark notes, “This house is Britain”; he shows how an unexceptional house on an unexceptional street can be a prison. Clark makes his invisible subject perceptible through his traces, both physical and legal. He lays it all out for us to inspect. Clark’s contribution is to provide a context in which these documents, both transparent and opaque, can be reviewed, a context outside of legal discourse, a context that otherwise would not exist, and as such, Control Order House is invaluable.